The mission of the Declarative 3D for the Web Architecture Community Group is to determine the requirements, options, and use cases for an integration of interactive 3D graphics capabilities into the W3C technology stack. This group is aimed to extract core features out of the requirements as foundation to propose feasible technical solutions. These should cover the majority of 3D use cases for the Web - but not necessarily all of them. There are upcoming open (e.g., WebGL) and proprietary (e.g., Adobe) proposals for imperative graphics APIs in the Web context but we are missing an easy way to add interactive high-level declarative 3D objects to the HTML-DOM to allow anyone to easily create, share, and experience interactive 3D graphics - with possibly wide ranging effects similar to those caused by the broad availability of video on the Web. The goal of this CG is to evaluate the necessary requirements for a successful standardization of a declarative approach to interactive 3D graphics as part of HTML documents. Thanks to the conference organizers for the support and we are looking forward to see you at the event! The main goal was to present the overall strategy shift to provide even more use cases and applications on the existing “polyfill” layers (e.g. 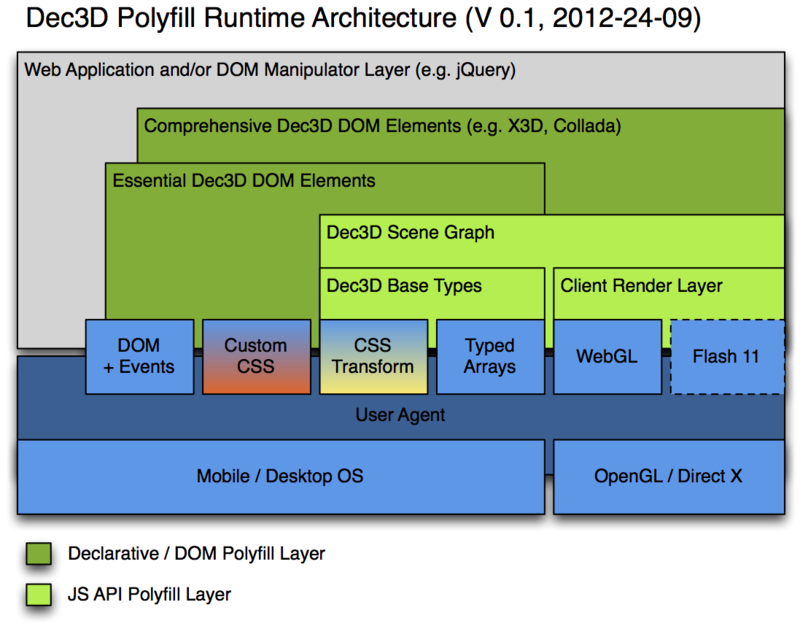 X3DOM and XML3D), instead of focusing on an overall declarative 3D specification upfront. The main goal therefore is to harmonize and extent this so-called polyfill layer to provide all the features and technologies needed for an extended set of targeted use cases. This includes CSS-based material systems as well as a deep integration into the DOM event and monitoring mechanism. The proposed system architecture was well received and people encouraged the presenters and declarative 3D community group to work on hard requirements for the related W3C specification and UA vendors. Another topic being discussed was the support for polyfill layers in general. Especially systems that provide new and novel DOM elements are not fully supported yet. The proposed web component are oriented to Web application developers, but layers that provide APIs and features, which are indistinguishable from native UA features are not yet adequately supported. 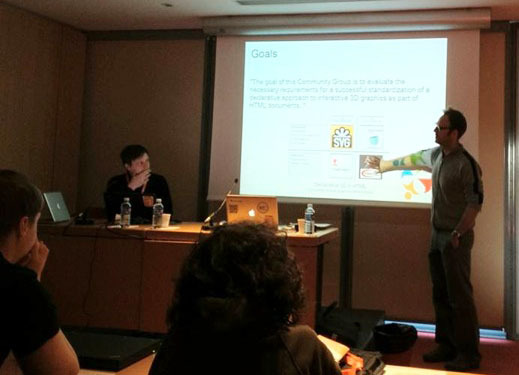 The 1st International Workshop on Declarative 3D for the Web Architecture (Dec3D2012) was held at the WWW2012 conference in Lyon, France on April 17, 2012. This workshop was organized by the Declarative 3D W3C community groupled by DFKI, Fraunhofer and the Web3D Consortium. Johannes Behr (Fraunhofer IGD) together with Kristian Sons (DFKI, who is sitting to the left), presents the community group's goals. We examine the requirements, options, and use cases for an integration of interactive 3D graphics capabilities into the W3C technology stack in a declarative way. While imperative graphics APIs are powerful and necessary, a ‘Declarative 3D’ approach can provide web authors an easy way to add interactive high-level declarative 3D objects through the HTML Document Object Model (DOM) allowing web authors to easily create, modify, share, and experience interactive 3D graphics using HTML documents. The workshop was an open platform to discuss the Declarative 3D initiative and also present current technologies, demonstrations, and research papers on Declarative 3D. It was apparent from this workshop that there is a need and interest for a Declarative 3D solution for the Web. Participation, coordination and collaboration between industry, browser vendors, developers and standards organizations are necessary for Declarative 3D to become a seamless part of the Web infrastructure. The workshop started with an overview and motivation for the Declarative 3D effort followed by the keynote speech by Robin Berjon who presented the harmonious path to HTML based on his experiences with SVG standardization. Following the keynote speech were demonstrations of innovative applications that deeply integrate 3D graphics and HTML, among others, Fraunhofer and DFKI reported on X3DOM and XML3D as models for an easy to use 3D hypermedia publishing frameworks. Two research track sessions consisted of interesting presentations on Declarative 3D Requirements, Use Cases, Visualization, Semantics and Services presented by researchers from around the world. The workshop ended with a discussion moderated by Ivan Herman (W3C) on how to achieve success in moving this effort forward as a W3C working group and eventually a W3C Declarative 3D standard. Work is in progress, gathering use cases and deriving requirements from these use cases. This group will present common use cases that define how 3D might intersect and interact with HTML5, DOM events, CSS, SVG, GeoLocation, Augmented Reality (AR), Efficient XML Interchange (EXI) and other key working groups. Certain complex data types and computations are also of mutual interest. We are hoping the Declarative 3D approach interests the industry and browser companies and we look forward to your active participation. The W3C “Declarative 3D community group is not restricted to W3C members and is open to the public. The deadline for submissions to the Declarative 3D Workshop at WWW2012 conference has been extended. The new deadline is 29th February, 2012, 23:59 CET. We are pleased to announce the first International Workshop on Declarative 3D for the Web Architecture in conjunction with WWW2012, 21st International World Wide Web Conference (WWW2012) in Lyon, France. Declarative 3D Use-Cases and Requirements: Discussion of the use cases, where embedding 3D data in HTML using declarative approach provides significant benefit; deduction of the requirements for the D3D specification. Declarative 3D and DOM: Discussion of integration of 3D with existing and future W3C standards, specifically: integration of high-level scene concepts; integration with client and server side rendering services, 3D REST; integration with existing security aspects for content delivery and visualization; content portability and platform independence. Declarative 3D in current web browsers: Exploring how the incorporation of declarative 3D graphics can be done in currently popular web browsers (e.g., by using WebGL in WebKit or Gecko); what are the possible difficulties? Declarative 3D User Interface Issues: Novel interfaces and interaction methods for online 3D + HTML content; mobile 3D Web interfaces, interaction techniques; accessibility and usability of 3D Web content. Submissions must be formatted using the ACM SIG Proceedings Templates. Please note that the author list does not need to be anonymized, as we do not follow a double-blind review process. Submissions will be peer reviewed by at least three independent reviewers. Accepted papers will be presented at the workshop and included in the workshop proceedings (published online at CEUR-WS). Please submit papers via EasyChair. 2:30-3:30 in Grand Salon Room B is the melee-selected meeting time for our Declarative 3D breakout session today. Kristian and Johannes will present cool demos and go over all the great work on group goals, use cases, requirements and coordination with other W3C groups. Plus cool demos! We hope to see you there. Room announcement: the Declarative 3D group will meet in Marriott Room 1435 on Tuesday 1 October 2011 from 0830-1200. Participation is open. We are also likely to have a 90-minute breakout session Wednesday afternoon with meeting room to be announced soon. The Declarative 3D community group cordially invites other W3C experts to participate in these efforts. Summary: the Declarative 3D Community Group invites other W3C groups to consider common requirements and use cases of shared interest. Motivation. The Web evolved from a text based system to the current rich and interactive medium that supports images, 2D graphics, audio and video. These types of new media have made the Web experience richer, more attractive to users, etc, than ever before, and opened up possibilities for new types of applications and usage. The major media type that is still missing is 3D: synthetic, possibly photorealistic images in 3D with animation, as smoothly integrated in the everyday Web experience as images or video. Just as the appearance of images or video could open new application possibilities, access the 3D on a Web site would make it possible to include realistic models of 3D objects (from models of buildings to representation of the human body or the sceneries for computer games). As of today, such applications require separate applications or the installation of browser plugins; however the goal would be to achieve the same smooth inclusion of 3D content in a Web page like we experience today with images or SVG based 2D graphics. The Declarative 3D Community Group is building requirements for integrating 3D capabilities with other W3C technologies by defining common use cases. This group will present common use cases that define how 3D might intersect and interact with HTML5, DOM events, CSS, SVG, GeoLocation, Augmented Reality (AR), Efficient XML Interchange (EXI) and other key working groups. Certain complex data types and computations are also of mutual interest. CSS Based Material System: The current coloring system of HTML is controlled by a fixed set of CSS parameter. This should be extend to a open and dynamic material system supporting different types of shading. The FX/Adobe Proposal might be a first step into this direction. YACFUC: Yet Another Call For Use Cases!! This is simply a friendly reminder and plea asking for more Use Cases. We really want to get input from industry, people who actually have a need for 3D on the Web…what would you like to do with it? What type of applications would you like to see this technology address? Do you have a non-toy application that requires industrial strength graphics to accomplish your mission? Do you have a toy application that you would just like to see implemented for fun? No use case is too big or too small…the idea is to generate technical requirements based on the use cases. We don’t want to simply generate a bunch of cool requirement for academicians (no disrespect to them) that have little value in the real world..we want to make this stuff useful for real world applications. So you’re itching to contribute? Great…the simplest thing you can do is just email your use case to the public-declarative3d@w3.org list! That’s it your on your way to being the next great contributor of Declarative 3D! Fame and fortune are sure to follow. Want to make things more formal? Just join the group…it’s free, easy and open to all! and click on the “request an account” link in the little upper right “login” box. We look forward to your cases!